Excessive machine tool vibration during a precision grinding operation can result in poor workpiece quality in the form of chatter, rough finishes, burn, etc. One possible reason for excessive vibration is directly associated with the relationship between natural frequencies of a machine tool system and the operating speed of the grinding wheel spindle. 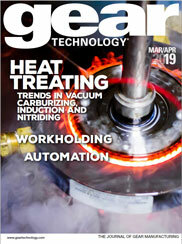 The complete Product News section from the October 2012 issue of Gear Technology.